Yunfu in 2013. Bridge over Nanshan river. Yunfu, formerly romanized as Wanfow, is a prefecture-level city in western Guangdong province, People's Republic of China. 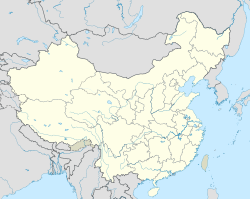 It borders Zhaoqing to the north, Foshan to the east, Jiangmen to the southwest, Yangjiang to the south, Maoming to the southwest, and the autonomous region of Guangxi to the west. Yunfu is considered sub-tropical and enjoys fine weather year-round, characterized by mild air temperatures, plentiful rainfall and sunshine, with an annual average temperature of 22 °C, annual average rainfall of 1,580mm and annual average sunshine hours of 1,418. The time-space distribution of rainfall is uneven in a year. It is overcast and dry in spring, hot and rainy in the summer, cool in autumn, and dry and sunny in winter. Yunfu has a total land area of 7,779 km2 (3,003 sq mi), including 1,868,200mu cultivated land, 1,353,700mu paddy field. In the total area, the mountainous area takes up 60.5%, the hilly area takes up 30.7%, making Yunfu a typical mountainous city. The city's total population is 2,600,900 people, of which the nonagricultural population is 887,000 people and the agricultural population 1,713,900 people, the per capita cultivated area is 0.718mu. There are 52 discovered minerals, 23 with proved reserves are being mined, of which metallic minerals include: gold, silver, copper, iron, tin, lead, zinc and manganese; nonmetallic minerals include: sillimanite, dolomite, marble, granite, barite, talc, kaolin, limestone, clay, rammell, potassium feldspar, mineral water, subterranean heat and rare minerals, etc. By the end of 2002, there were totally 254 certified mines throughout the city. Wikimedia Commons has media related to Yunfu. This page was last edited on 3 April 2019, at 23:42 (UTC).